This article by John Healey, Professor of Forest Sciences, Bangor University; John Halley, Professor of Ecology, University of Ioannina, and Kalliopi Stara, Postdoctoral Researcher, University of Ioannina was originally published on The Conversation. Read the original article. Since the dawn of history, human societies have ascribed sacred status to certain places. Areas such as ancestral burial grounds, temples and churchyards have been given protection through taboo and religious belief. As many of these places have been carefully managed for many years an interesting side effect has occurred – the sites often retain more of their natural condition than surrounding areas used for farming or human habitation. As a result, they are often called “sacred natural sites” (SNS). Today, as many other natural habitats have become degraded, researchers worldwide are increasingly interested in the role of SNS in biodiversity conservation. Most of the world’s belief systems, including Christianity, give places sacred status. In Mediterranean Europe, for instance, the grounds of churches – with their associated ancient trees – have become important SNS. One of the best examples is in the mountainous region of Epirus in north-western Greece. 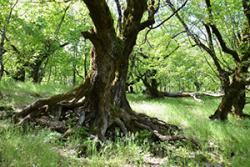 In the municipalities of Zagori and Konitsa almost every village has one or more sacred grove. These places have been protected through religious belief systems for hundreds of years. The groves are either protective forests that lie uphill from the village, or groups of mature trees surrounding outlying churches, monuments or other works of religious art. Activities such as the cutting of trees or livestock grazing have been either prohibited or strictly regulated in these places (and disobeying these prohibitions sometimes led to excommunication). The sacred forest of Panagia Aidonolaloussa, ‘Our Lady of the Nightingales’, in Epirus: Kalliopi Stara, Author provided (No reuse)We have recently been studying these Greek SNS as part of our SAGE (SAcred Groves of Epirus) project. Our team wanted to find out, using a rigorous research approach, whether SNS are more biodiverse than other forest areas, and, if so, what lessons conservationists could learn from this. To do this, our international and multidisciplinary group has recently completed the world’s first replicated systematic investigation into the claims that areas conserved as SNS are more biodiverse for different types of plant and animal. For our recently published study, we selected eight SNS in Epirus that covered a wide range of environmental conditions. Each was closely matched with a nearby non-sacred “control” forest which had been managed conventionally – sometimes through natural regeneration. We then conducted a detailed inventory in each site, of eight different groups of organisms. These ranged from fungi and lichens, through herbaceous and woody plants to nematodes, insects, bats and passerine birds. We found that SNS do indeed have a small but persistent biodiversity advantage. This is expressed in a number of ways, most clearly through the existence of more distinct communities of species among the sacred groves than in the control sites (this phenomenon is known as beta diversity). The group with the most notably higher biodiversity in the SNS than in control sites were the fungi. These often grow in dead wood or old trees, which usually get removed in conventionally managed forests. Of the species of passerine birds (a group that includes many songbirds) that are designated as having special conservation importance at a European level, we found twice as many species present in the SNS as in the control sites. Because these sacred sites are often quite small it is often said that their conservation benefits are marginal. But we found that the influence of size is relatively weak – even small SNS can play a significant role in biodiversity conservation. 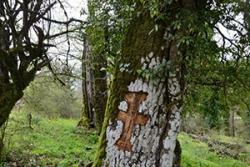 The carved cross in the trunk of this oak tree is a recent offering from a young shepherd to Saint Nikolas, patron of the church in Vitsa's sacred forest. :: Photo© K. StaraBut Epirus’s sacred sites are now in peril. The rules that linked belief and conservation that once protected the SNS have become difficult to enforce, due to changing population and land-use. The value of forests which protect from landslides and floods is no longer being recognised. The value of SNS is not just on the land that is sacred itself, these places can act as a nucleus, around which biodiversity can expand. In Epirus, forests have regenerated around many of the sites we studied over the past 70 years – despite humans farming the land. It should be noted that this can increase risks such as fire, as dense young Mediterranean forest is very flammable. Evidently the already well-conserved SNS are of great environmental importance across the world. So the next step is to link these sites into conventional conservation schemes. But it is vital that such strategies are closely aligned with the cultural status of SNS. Local communities are often highly motivated to maintain their sacred sites and associated belief systems but lack the resources to do so. A fully collaborative approach between conservation professionals and local communities could offer a solution that conserves both biodiversity and local cultural values.